A Japanese insurance company reportedly is replacing 34 workers with an artificial intelligence system, and industry analysts say the same could start happening in the U.S. this year. Fukoku Mutual Life Insurance Company, a 94-year-old company based in Tokyo, is getting ready to replace human workers with an IBM Watson artificial intelligence-based system, ABC News in Australia reported. A spokesperson for Fukoku Life could not be reached and IBM did not respond to a request for comment, but ABC News said that 34 employees will lose their jobs by the end of March, when the Watson system takes over handling insurance payouts by culling hospital records, patient medical histories and injury data. The final payments will still be handled by human workers. The report also stated that the company expects to increase productivity by 30%, while saving $1.65 million on employee salaries. Fukoku Life will spend $2.36 million to install the system and about $177,000 in annual maintenance costs, meaning the new system should pay for itself in less than two years, ABC News said. The report is likely to continue to validate fears that robots and A.I. are putting people out of work. With A.I. systems making steady advancements that enable them to increasingly learn on their own, make decisions and understand human behavior, companies are widely expected to use the technology to sidestep human workers and get work done without needing to pay salaries and provide health care or vacation time. By 2021, intelligent systems and robots may take up to 6% of U.S. jobs, according to Forrester Research. A year ago, the World Economic Forum, a Geneva, Switzerland-based organization focused on analyzing and improving the state of the world, reported that the next tech revolution, which includes A.I. and robotics, could mean the loss of 7 million jobs over the next few years. The forum also stated that at the same time, 2 million jobs would be created in the fields of computer science, engineering and math. It's also expected that technology will create new jobs that will replace the ones that smart systems are taking. Human workers may also increasingly work alongside smart systems. For example, a worker might have a smart assistant that finds information needed for a project before the worker realizes he or she needs it. However, the concerns today are over jobs that are lost because of A.I. "It's certainly something workers who work with large volumes of data will be concerned about," said Zeus Kerravala, an analyst with ZK Research. "There's no question that A.I. systems, like IBM's Watson, can analyze and interpret data faster and more accurately than people. We are in the digital era, where the currency of business is speed, and A.I.s can make decisions faster than people with massive amounts of data." With A.I. systems like Watson, data workers, such as those at an insurance company like Fukoku Mutual Life, could be at risk. Kerravala said he also expects to see smart systems replacing American workers possibly as soon as this year. Judith Hurwitz, an analyst with Hurwitz & Associates, agreed that some U.S. jobs will be lost to A.I., but she said there's plenty of room for employees to grow in their jobs alongside smart systems. "This is something that workers will have to be concerned with," Hurwitz said. "However, machines cannot operate in isolation from human judgment. The best use of these analytics systems is to work in collaboration with those that have advanced knowledge of their area and can be supported by smart systems." Technology has been replacing jobs held by people for decades, the analysts noted. It's not unique to artificial intelligence. The use of A.I. is another technology revolution that will change the kinds of jobs that are available, said Dan Olds, an analyst with Orion Research. "As A.I. 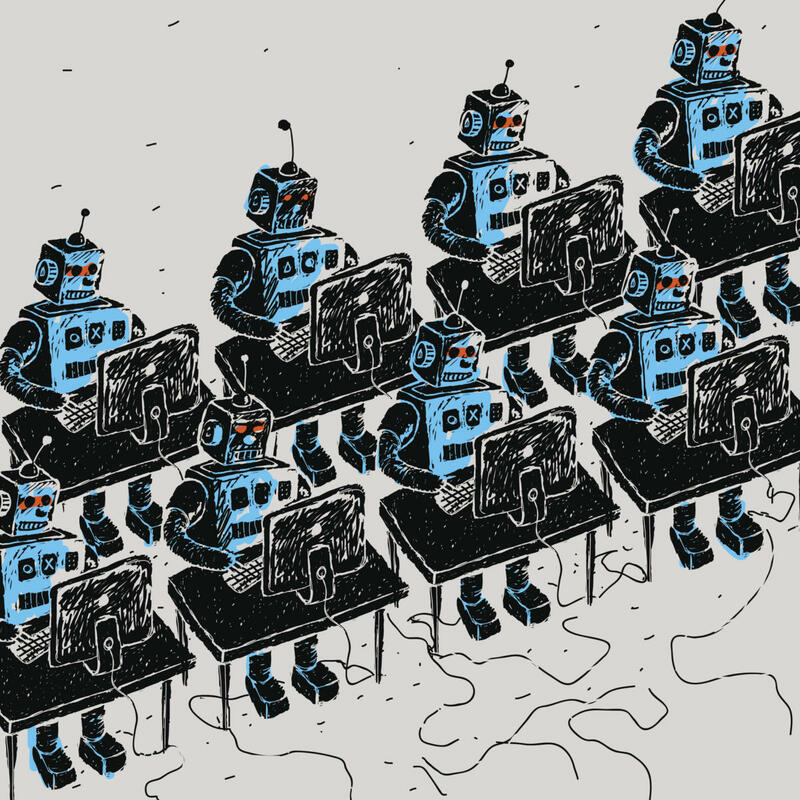 systems become more sophisticated and less expensive, workers worldwide are going to see some of their functions being replaced by them, or they're going to more likely find themselves working with A.I. systems in their jobs," he said. "This will mean that they'll need to be open to working with A.I. and building a productive relationship with it."